What Neustadt means here is that presidents can aggressively use the information available to them […] to sense and avoid policy disasters. They’ll do so, he believes, because policy disasters for the nation are political disasters for its president, and what presidents are really experts in is avoiding political disaster….They’re suppose to have excellent political antennae. Presumably, they wouldn’t have made it to the White House without them. ….Unless, that is, the president isn’t an expert. And so back to George W. Bush. We’re still early in the building of the history of the Bush years, but here’s my guess. We’ll find that what we saw was pretty much what was happening. He didn’t act aggressively when faced with potential policy disaster — whether we’re talking about the summer of 2001 and terrorism, or 2003-2005 in Iraq, or 2004-2008 and Afghanistan, or 2007-2008 and the economy, or Katrina, or anything else. We’re going to find that he strutted around a good deal, but was otherwise passive and indifferent, and easily manipulated by those around him. And my guess is we’re going to find the big things that went wrong (terror, Iraq, Afghanistan, torture, the economy) joined by dozens of smaller things that slipped through the cracks for eight years. One last time: I’m not talking about ideology or policy, just the basic skills of the presidency. I think I’d put this a little differently. The problem isn’t that Bush wasn’t an expert at sensing the political winds and understanding partisan coalitions. He was. In fact, great political antennae were pretty much all he had, and that was the problem: he seemed to believe that politics and ideology were everything. It’s not that he didn’t care about policy disasters, it’s that he never seemed to believe that policy actually mattered. And if policy doesn’t matter, how can it ever lead to disaster? You can see this in the things that interested him and the things that didn’t. When the subject was something simple and ideologically pure, he was genuinely engaged. This list includes things like tax cuts, making war on Saddam Hussein, privatizing Social Security, and Terri Schiavo. But when the subject was something that was inherently more policy heavy, he just went through the motions. This list includes things like NCLB, Sarbanes-Oxley, McCain-Feingold, prescription drugs, and Katrina. Bush’s problem wasn’t a lack of appreciation for power and how to wield it. His problem was that he fundamentally didn’t believe that policy had any real impact on how things turned out. My sense of the man is that he viewed government as a machine that always ran with the same level of competence, so it was foolish to waste your time worrying about that. Just give the right orders and let the chips fall where they may. They’re going to fall about the same way regardless, a mix of good and bad, and the best a president can do is make sure they at least fall in the right direction. There’s an odd myth in Republican circles that presidents should act like CEOs, and the way CEOs act is to hire good people and then get out of their way. But nobody who’s been a CEO actually believes that. Different managers have different appetites for hands-on management, but no good CEO thinks that she can just hand out some marching orders and then head off to the links for a quick nine holes. Execution matters. 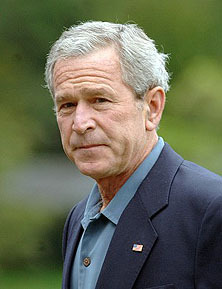 But George bought into the myth as thoroughly as any president in history, and he (and we) paid the price for that.